Two especially designed guided relaxation techniques to develop control of stress from work. 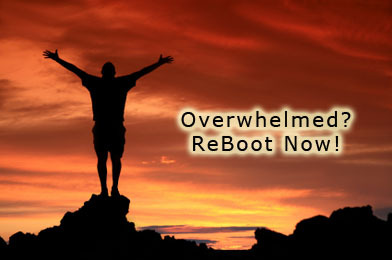 Combat overwhelm with a 20 minute guided relaxation. After developing relaxation skills, you can “ReBoot” with a special 10 minute relaxation exercise on the job or after work. Allow 4-6 weeks of regular daily use to begin to see change and 8-12 weeks for the maximum benefits. About 36 minutes in duration. This set of guided relaxations is ideal for new comers to stress management, especially, for busy business people. It is not as targeted as guided relaxations from the Health Series but is a real favorite as an introduction into relaxation. The benefits from this exercise will include: saving you time and energy, creating better focus and problem solving, and helping you to survive the challenges of today’s stress world with more grace. For more assistance in tailoring this program for your individual requirements consider some coaching. Though this may cost you more money and some time, this approach may provide you with the best ways to integrate these techniques into your busy schedule.